Wood River High School senior Jennie Williams has battled a serious ankle injury for a full year, yet she was ultra-determined to carry her Wolverine girls' golf team to a state tournament berth Tuesday at Jerome Country Club. Seven months after ankle surgery to replace three ligaments, and a week after re-injuring her ankle, Williams shot an 82 Tuesday to become the Great Basin Conference runner-up and lead the Wolverine girls to second place behind perennial power Twin Falls. Twin Falls (343 points), led by medalist Katherine Reed (81) and Sydney Lee (82), won the meet ahead of second-place Wood River (422 points). 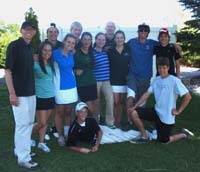 Both teams qualified for the State 4A tournament Monday and Tuesday, May 14-15 at Blackfoot Municipal Golf Course. It's the third state tournament ticket for Williams, who on Thursday signed a letter-of-intent to play college golf for North Idaho in Coeur d'Alene. But her priority was carrying the rest of her team with her to state—and she achieved that. Wood River coach Chet Olson said, "The girls had a great day at the district tournament. "Jennie Williams was exceptional—a real reward for her hard work over the past four years. She overcame real adversity after re-injuring an ankle she had surgery on last year. It was questionable she would be able to play but she wore an ankle brace, drove a cart and shot an 82. "The other girls stepped up giving our program its third state tournament berth in four years. Bella Stimac stepped up huge for us with a 104. Alma Stosius shot a solid back nine resulting in a 114. "Sammy Sutton also stepped up and turned in a 122. She'll be going to a state tournament for the third time this year (soccer, basketball). Not sure how many freshman from our school can say that. Hannah Haupt was sick during the tournament and had her car stolen last week (with her clubs in it). She played with borrowed clubs and did her best with a 134." Hailey's boys (342) placed fourth of six schools behind state qualifiers Twin Falls (291) and Canyon Ridge (309). Wolverine scores were freshman Rielly Neel 84, senior Sage Sauerbrey 85, sophomore Tyler Spence 88, junior Ricky Jeneson 88 and senior James Petzke 99.